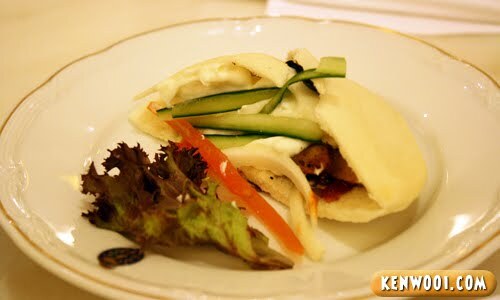 I’ve stayed in Hotel Istana, but never dined in any of its in-house restaurant before. 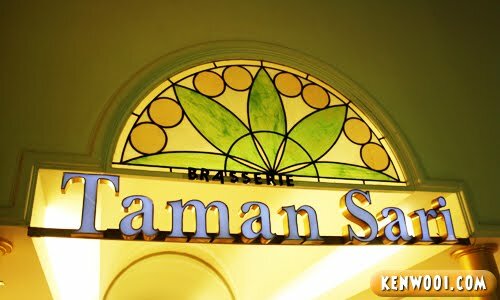 That’s until I got the opportunity to dine at the hotel’s very own Taman Sari Brasserie. 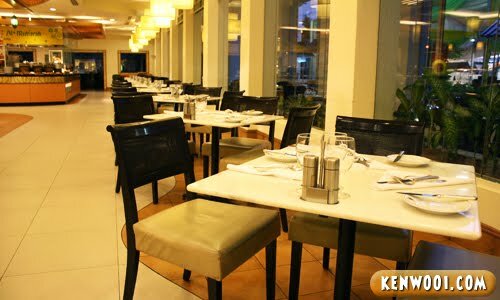 Located at the heart of Kuala Lumpur, it’s a delightful dining area with landscaped gardens view and just next to the swimming pool. Stepping into this brasserie gives me a classy impression. 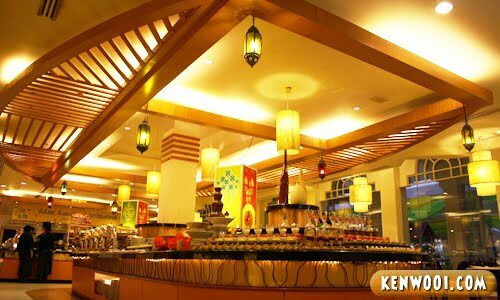 Known for its 5-star International Buffet, it’s served on any day – that includes public holidays too. 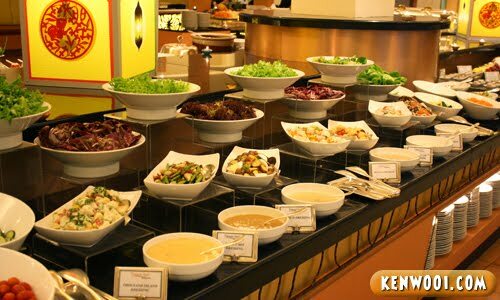 The salad bar with a variety of salad condiments, dressings and sauces. They have different kinds of green leafy vegetables too – 7 types! Certainly a lovely feast for the salad lovers. Other than that, there is a bread section. 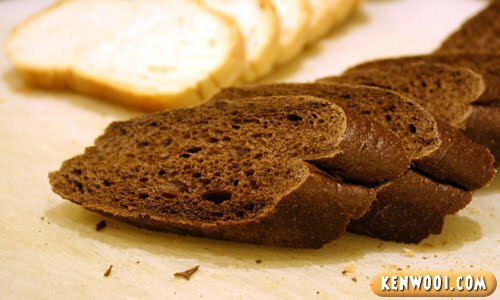 A few types of breads are available, served in individual baskets, and small butter packs come along with it. Next up, the main courses. 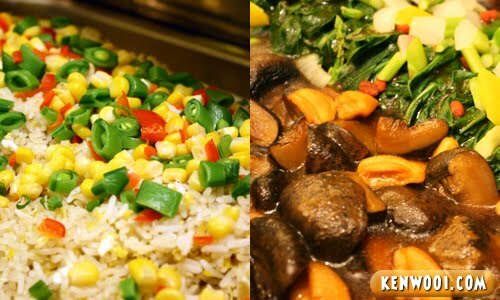 On the left, the Chinese Style Fried Rice topped with ingredients such as corn and chilly slices. A simple yet nice blend and the aroma smells good. Next is the Braised Mushroom and Pacific Crab with Seasonal Vegetable. I like the way this dish is prepared. For me, mixing the mushroom with some vegetable creates a certain texture and luscious taste. Ahh, these 2 are definitely my favourite. Fried Chicken with Plum Sauce (on the left) and Steamed Fish with Soya Sauce. Nicely fried and steamed, and gotta love the sauces. Tender and simply scrumptious! 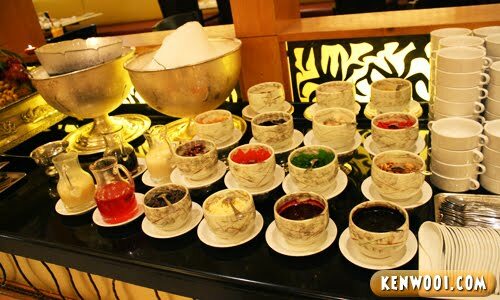 The buffet has also an ice kacang counter with more than 10 different condiments and toppings. Of the many buffet ice kacang counters I’ve seen, this has got to be the one with the most selection. 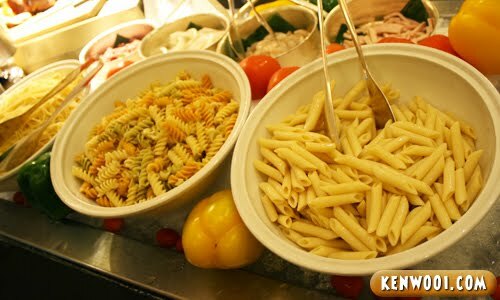 For an Italian touch, the buffet also consists of some pastas. Just pick your choice, and a chef will cook it right away! 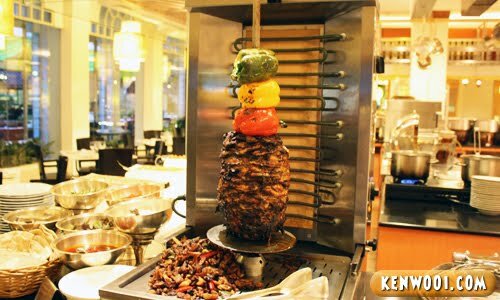 Originated from Arab, the Shawarma is a sandwich-like wrap of shaved grilled meat. This one in particular is chicken meat and it’s eaten with pita bread and some toppings. This is the one I made myself. 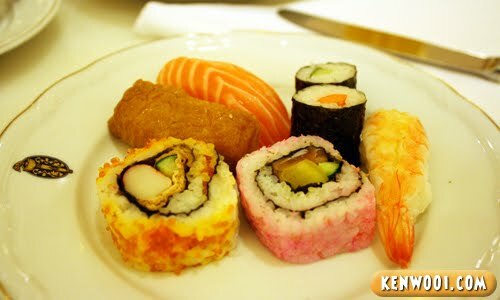 Oh yeah, not forgetting the tiny selection of Japanese sushi! The choices are pretty limited, but it’s a typical Japanese sushi nonetheless. Dessert spread! 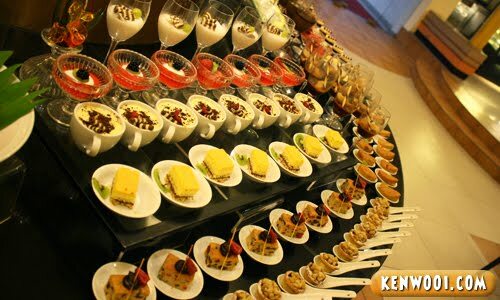 Look at the assortment of delectable desserts. Very well-presented, the dessert section definitely stands out from the rest. More desserts for the guests to feast. Generous bowls and glasses of desserts – cakes, jellies, creamy stuff, you name it. And even more desserts! Certainly a fantastic dessert heaven for everyone. I like! It was quite a pleasurable dining experience. 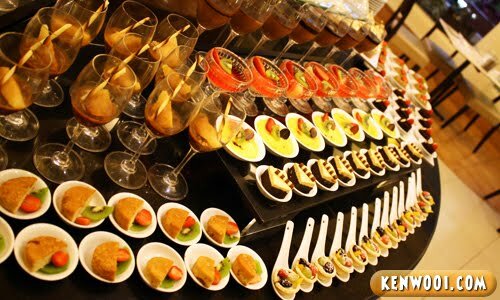 Well, as always – the buffet has many dishes to choose from. In fact, there are too many that only a handful got featured here. Anyway, normally the buffet price is at RM96. But now, for just a limited time, there is a cheaper deal by everyday.com.my. amat menarik apabila tengok gambar-gambar di atas! sekarang aku sudah lapar dah! Terima Kasih kerana “Sharing it” LOL! 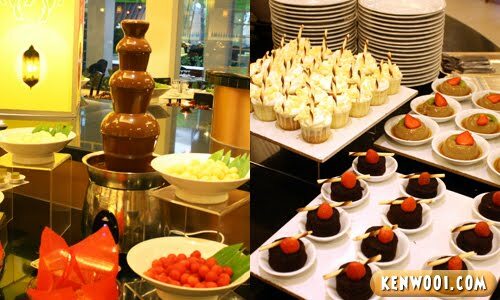 Everytime when go to Buffet, the first section I will look is the dessert part. Oh my! The dessert is so many!! kenwooi. y u always eat nice nice?!!! Seeing those pictures reminds me of an episode of The Amazing Race U.S. where they had to determine which food was actually fake. 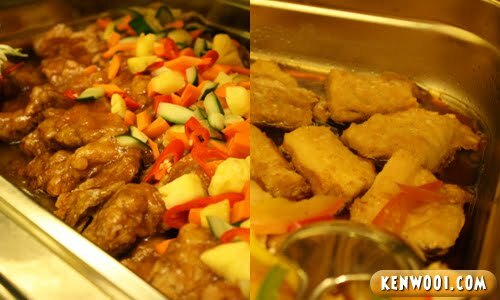 anyway, buffet is always nice especially due to the enormous choice of food being offered. Gosh, now i sound such an epicure! i remember that episode!! and yes u are right, it reminds me of that too! This puasa season I’ve been to 4 buffets dy. If I’m forced to go another one, I might actually vomit at sight. Despite my chubby appearance, I really can’t eat much. SO buffets are a total waste on me. Seriously. The buffet looks nice. I would like to try it. Great value with 50% discount. Thanks for sharing. Its all about eating that we Malaysians cannot resist as long as it does not stick and show off on our figure. 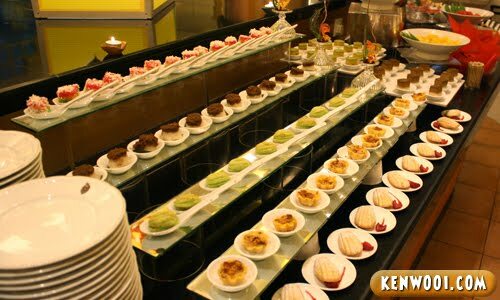 Ken, always can eat nice one…looking at the way they arrange the desserts…whoa….want to hug all..
the food look so amazing…..lapar owww!! As far as i’m concern there’s no ‘WOW’ from the buffet. What we see from the photos are not what we may find. I was there last night and it was such a dissapointment.Reached there around 8.30pm and their salt crusted salmon had finished, most of the dishes tonight was indian, there were only 4 chinese dishes, fried rice, flower crab, cuttlefish and veggies.Seafood was pathetic looking baby flower crabs, mussels n crab stick!! !Food was tastless and found a pebble in my dhall. One of the staff couldnt speak english when spoken to and restaurant was warm. Some desserts that were supposed to b chilled was warm, churros was predipped into something that looks like choc sauce but taste like milo, fresh fruits of honeydew, rock melon n papaya was unripe n tastless. Choc mousse cake was good. Seafood chowder tasted better with a dash of salt and pepper. Overall, i wouldnt go back again and parking in their basement cost Rm 10. I felt like I was being cheated by Hotel Istana. 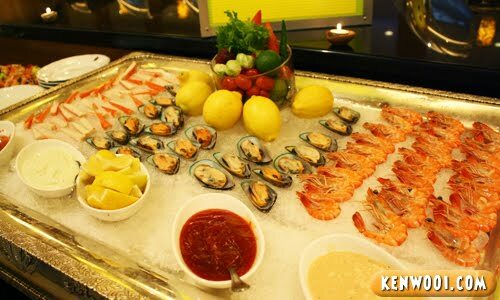 I had the buffet dinner recently and the food was really bad. Seafood was not fresh at all.